Photo credit: Adapted by WhoWhatWhy from Clean Missouri and Johnmaxmena / Wikimedia (CC BY 3.0). Missourians earlier this month overwhelmingly approved a constitutional amendment to reduce corruption and gerrymandering. Now, Republicans are already trying to weaken the measure. 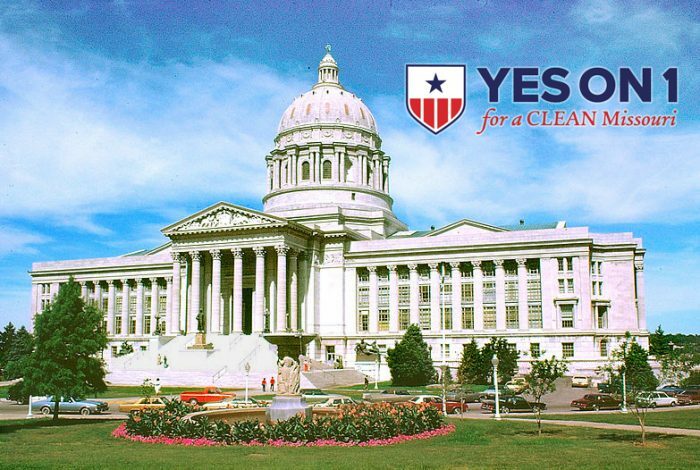 The measure, officially “Missouri Amendment 1, Lobbying, Campaign Finance, and Redistricting Initiative,” easily passed with 62 percent of the vote on Election Day. As the name would suggest, the ballot initiative was broken down into three parts: lobbying reform, campaign finance reform, and redistricting reform. In addressing lobbying abuses, Amendment 1 forbids state legislators from accepting paid lobbyist positions for two years after leaving the legislature. The measure is aimed at limiting the power of “the revolving door” of politics: the phenomenon of politicians becoming lobbyists and lobbyists becoming politicians. As for campaign finance reform, Amendment 1 limits campaign contributions for state senators and state representatives to $2,500 and $2,000, respectively. Legislators are also now forbidden from accepting any gift from a lobbyist that exceeds five dollars. Finally, Amendment 1 appoints a non-partisan state demographer to draw congressional districts that promote partisan fairness and competitiveness. Many Missouri Republicans, including Senator-elect Josh Hawley, opposed the initiative. Republicans outnumber Democrats in the Missouri State Senate 24 to 10 and in the Missouri State House 116 to 45, both of which are veto-proof majorities. Republicans started a group, euphemistically called Fair Missouri, which aims to put forth a new ballot measure that would effectively nullify Amendment 1. One possible tactic could be an attempt to take out “partisan fairness” when drawing districts that Amendment 1 calls for. The group has secured $150,000 in funding. The Show-Me State is showing us something. It doesn’t matter that efforts to reduce public corruption and create fairer elections should transcend party. It doesn’t matter that Missourians voted in a landslide to enshrine these reforms into law. What matters is that Republicans control Missouri, and they’ll do anything to keep it that way.